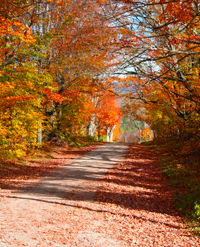 The New England fall foliage is beautiful to see this time of year but when wet or in piles, leaves present driving hazards unique to the season. * Reduce your speed, especially on roads that curve or have sharp turns. Even with anti-lock brakes, it’s harder to stop on slippery surfaces. *Leave enough room between you and the car in front of you. This is always a safety measure but is especially important when road conditions are hazardous. *Leaves can often mask road imperfections, such as potholes, or even curbs and street markings. Be careful of piles of leaves and be conscientious of road markings. If you have any questions on Massachusetts Auto Insurance or any of your insurance needs, our agents at Kerrigan, O’Malley & Bailey Insurance would be happy to help! Call us at (978) 365-2302, visit our website Massachusetts Insurance Agency or stop by our office. This month is fire safety month. Smoke Alarms: “A Sound You Can Live With!” is National Fire Protection Association’s official theme for Fire Prevention Week, which ran from October 3-9. This year’s campaign was designed to educate people about the importance of smoke alarms and encourages everyone to take the steps necessary to update and maintain their home smoke alarm protection. Aside from the obvious benefits from having smoke alarms, some companies provide a discount on your homeowners insurance policy for having them. * Smoke alarms cut the risk of dying in a reported fire in half. * Overall, three-quarters of all U.S. homes have at least one working smoke alarm. * Each year, nearly 3,000 people die in U.S. home fires. no smoke alarms or no working smoke alarms. * No smoke alarms were present in 40% of the home fire deaths. * In 23% of the home fire deaths, smoke alarms were present but did not sound. alarms were the leading reason for disconnected alarms. homes with fire deaths were powered by battery only. 67% of the respondents who reported having smoke alarms said they were powered by battery only. * In a 2008 telephone survey, only 12% knew that smoke alarms should be replaced every 10 years. the time; battery-powered smoke alarms operated 75% of the time. * Interconnected smoke alarms on all floors increase safety. * interconnected smoke alarms were more likely to operate and alert occupants to a fire. * Cooking is the #1 cause of home fires and injuries. * Smoking is the leading cause of fire deaths. * Heating is the second leading cause of home fires, fire deaths and fire injuries. * Electrical failures or malfunctions are factors in roughly 50,000 reported fires each year. * Roughly 30, 000 intentionally set home structure fires are reported each year. Reproduced from NFPA’s Fire Prevention Week Web site, http://www.firepreventionweek.org. ©2010 NFPA. You are currently browsing the Koinsurance's Blog blog archives for October, 2010.